Two summers ago, my dad bought a miter saw for the first time in his 70-ish year existence. I was shocked; how could my very handy, son of a legit woodworker father never have used a miter saw? The one single tool that I had coveted for years, but didn’t have the space for, my dad had done without for his entire life. Apparently, owning a table saw negates the need for every other tool ever, I guess? When I went to visit him, I promptly realized he was using the miter saw wrong! Pointing this out, and promptly pulling up five websites that agreed with me was one of my proudest daughter moments ever, not going to lie. But I realized, if my super-handy dad could make mistakes using a miter saw, there were probably plenty of beginner power-tool users who needed a quick miter saw safety guide. 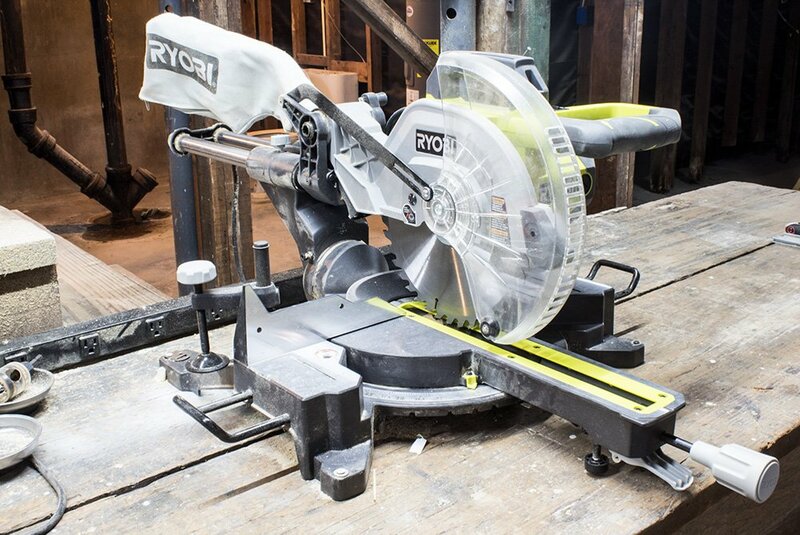 So without further ado, here are six of the most important miter saw safety tips! Note: This post contains affiliate links. If you click and make a purchase, I may receive compensation (at no additional cost to you.) I only recommend products that I personally use and love, and any support helps keep this little blog going! 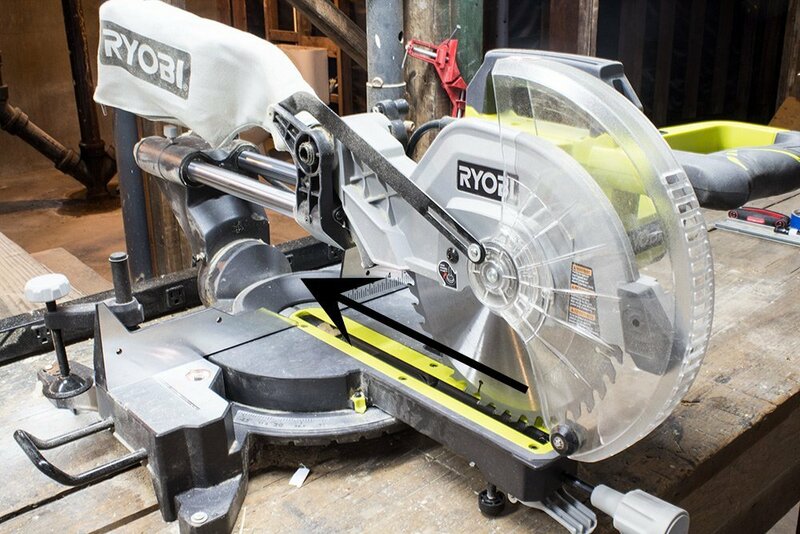 Note: I have this Ryobi miter saw, which I absolutely love! If you're looking for a quality budget miter saw that can do pretty much everything (sliding, compound, single bevel,) I'd check it out! 1) Keep your hands 6 inches away from the blade. This is the number one safety rule for miter saws, in my opinion. Miter saws are pretty safe, for saws at least. Given that they're relatively stationary and have automatic blade guards, it's almost difficult to inadvertently cut yourself. The one way to do so? Put your hand in the path of the blade. Keep your hands 6 inches away from the blade at all time, and you'll eliminate the easiest route to injury. 2) Push, don't pull, a sliding miter saw. This is the mistake my dad was making when he first bought his miter saw. When using a sliding miter saw, you should be sliding the blade away from you. See picture above! Have a clear plan for your project with our FREE Project Planning Worksheet. Simply click the button below to get your Project Planning Worksheet delivered straight to your inbox! 3) Don't raise the blade until it's come to a complete stop. Safety-wise, if the blade is embedded in the wood, it's not cutting your hand. Pretty simple. But this tip is also good practice when woodworking. If you bring the blade back up before it has completely stopped spinning, it will cut just a little bit more off your project on its way up, leading to a less accurate cut. 4) Keep the blade lowered and the saw unplugged when not in use. A couple years back, I took a construction class. My instructor, understandably, was a bit of a safety fanatic, if it's possible to be too fanatic about safety. He was very insistent that your saw should be locked in the "down" position, and unplugged when not in use. His reasoning? If a kid (your own, a neighbor's) wandered into your shop or garage unattended, it would be near impossible for them to injure themselves if the saw was locked and unplugged. Unlocked and plugged in? Comically easy for an unknowing person to injure themselves. My saw has a little knob to lock it in the lowered position. Yours should too! Check the owner's manual if you're not sure where to find it! 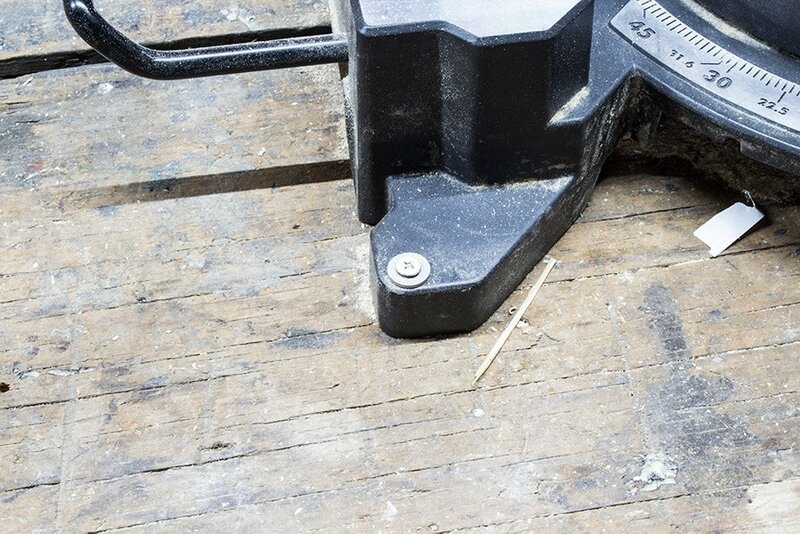 5) Secure your miter saw to a table or base. For first month or so after I got my miter saw, I didn't have it bolted to my workbench. Anytime I cut a particularly large or thick piece of wood, the saw would have a tendency to wiggle around a bit as I cut. I got lucky and never got injured. But it definitely could've ended badly, and I'm so glad that my saw is now safely bolted to my workbench! 6) Wear eye and ear protection. You know you should do this. You know that sawdust can bother your eyes, and that long-term, the noise from miter saws can help deteriorate your hearing. But right now, those might seem minor. I get it. But here's the thing: if your saw hits a knot in the wood, a large piece of wood could go ricocheting across the room - or straight into your eye. Wear eye and ear protection. 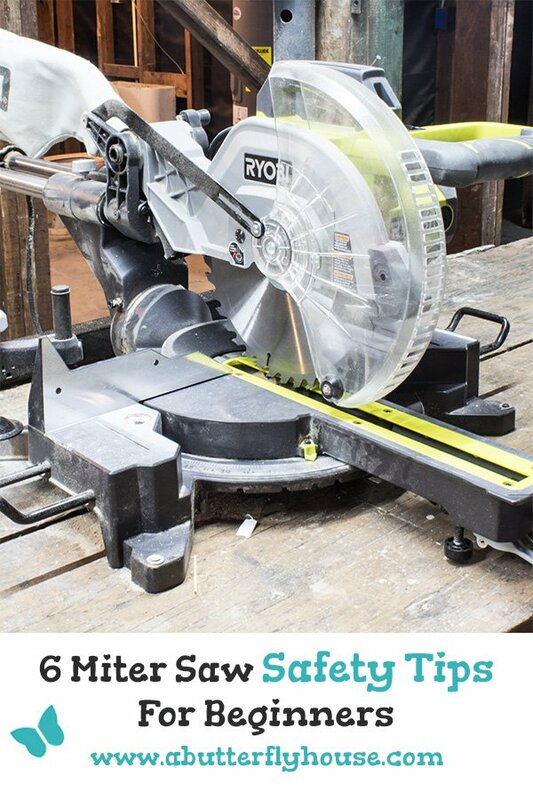 I hope these six miter saw safety tips help keep you and your family healthy and safe, and that you feel more confident using a miter saw after reading! If you have questions, let me know, I’d love to hear from you in the comments below! Find this useful? Save it to Pinterest! Want to see more? Follow me on Pinterest and Instagram! In addition to weekly emails with inspiring DIY tips and ideas, you'll get our FREE Project Planning Worksheet to help you turn all your ideas into reality! Just click below! 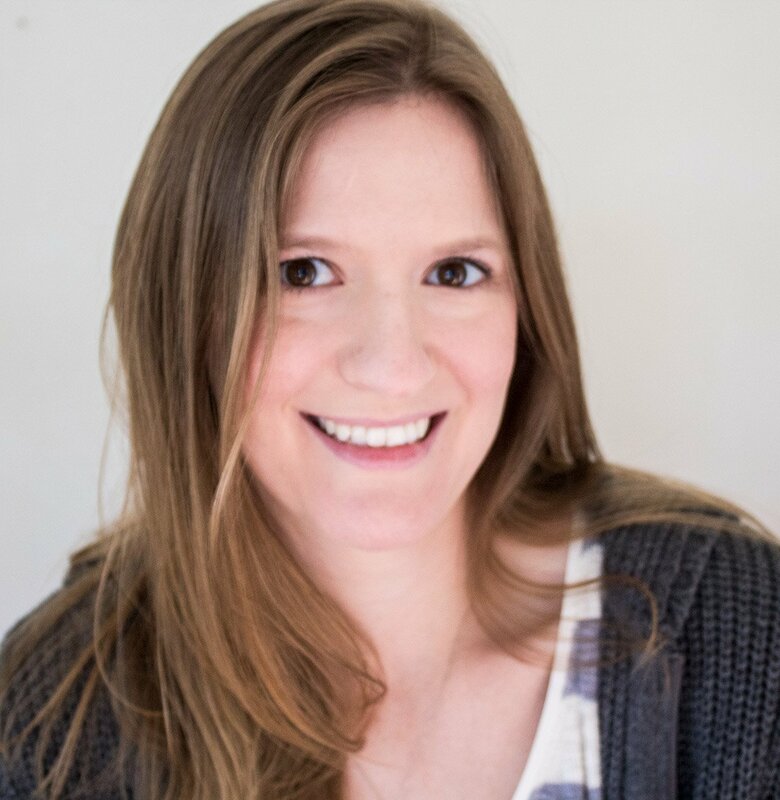 Hi there, I'm Lindsay Fay - Math teacher on temporary hiatus to transform my 100 year old house into the perfect home. Click around to join me in learning how to build, decorate and (sometimes!) destroy your way to a beautiful house. Have a clear plan for your project with our FREE Project Planning Worksheet! Simply opt-in below to have the worksheet sent straight to your inbox! 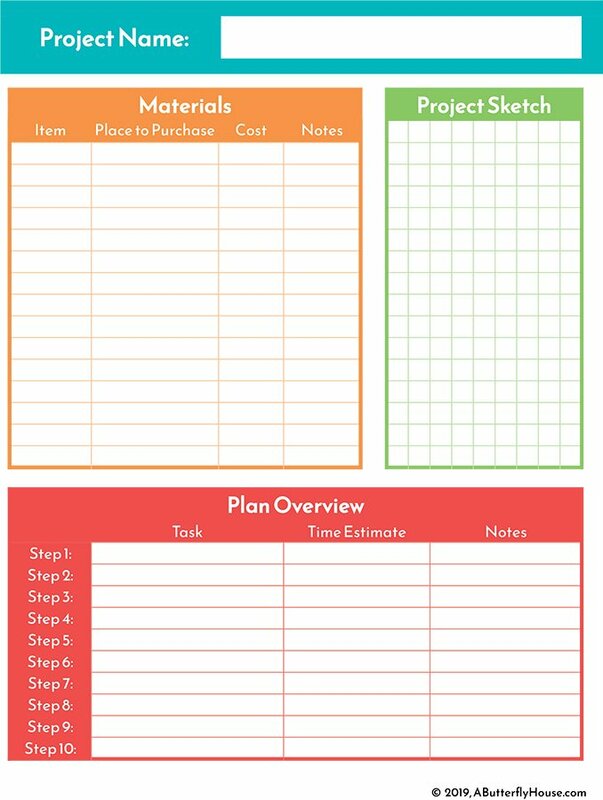 Our simple Project Planning Worksheet will have your DIY projects finished in no time! Simply opt-in below to have the worksheet sent straight to your inbox!